LOS ANGELES (AP) — LeBron James' first season with the Los Angeles Lakers is over. NEW YORK (AP) — D'Angelo Russell stood high above Times Square, a spot where stars are showcased in New York. EAST LANSING, Mich. (AP) — Magic Johnson plans to hug it out with the Los Angeles Lakers to help them cope with the fallout from the NBA trade deadline. EAST LANSING, Mich. (AP) — Magic Johnson was back at Michigan State, joining his teammates to celebrate the 40-year anniversary of winning the national championship. The Hall of Famer and Los Angeles Lakers president had plenty of opportunities to flash his familiar smile. BOSTON (AP) — LeBron James won't be playing alongside Anthony Davis this season. But he does have a team he's hoping can build on a big win over its longtime rival. TERRE HAUTE, Ind. (AP) — Cameron Krutwig had 16 points and 10 rebounds, Marques Townes also scored 16 points and Loyola-Chicago spoiled Indiana State's celebration of its 1979 team with a 75-67 victory on Saturday in front of a sellout crowd of 10,200, including NBA legend Larry Bird. EAST LANSING, Mich. (AP) — Gus Ganakas, who was the coach of Michigan State's men's basketball team from 1969-76 and remained part of the athletic department until his retirement in 2000, has died. He was 92. "Gus was one of the most selfless and positive people that I've ever been around," said Tom Izzo, the men's basketball program's current coach. "Our thoughts and prayers are with the entire Ganakas family as they grieve their loss." CHARLOTTE, N.C. (AP) — LeBron James and Lonzo Ball gave the Lakers multiple triple-doubles in a game for just the second time, and Los Angeles routed the Charlotte Hornets 128-100 on Saturday night for its third win in four games. James had 24 points, 12 rebounds and 11 assists, while Ball had 16 points, 10 rebounds and 10 assists. Magic Johnson and Kareem Abdul-Jabbar are the only other Lakers to accomplish that feat in the same game, doing so on Jan. 22, 1982. OKLAHOMA CITY (AP) — Russell Westbrook was more introspective than usual Wednesday night. LOS ANGELES (AP) — Veteran center Tyson Chandler signed with the Los Angeles Lakers on Tuesday, two days after reaching a buyout agreement with the Phoenix Suns. SAN DIEGO (AP) — LeBron James rubbed his hands in chalk powder at the scorer's table, yelled "Yes!" to ecstatic fans in the first few rows and the Los Angeles Lakers' new era was underway. Playing in the same arena where Magic Johnson made his regular-season debut for Los Angeles 39 years ago, James captivated the crowd from the start of the Lakers' exhibition opener Sunday night, a 124-107 loss to the Denver Nuggets. EL SEGUNDO, Calif. (AP) — Former Los Angeles Lakers player and coach Kurt Rambis has rejoined the front office. Rambis will be the Lakers' senior basketball adviser, president of basketball operations Magic Johnson announced Friday. The 60-year-old Rambis will "support the basketball operations and coaching staffs in their day-to-day functions," according to a team news release. EL SEGUNDO, Calif. (AP) — Magic Johnson can already see LeBron James' impact on the young Los Angeles Lakers before they've even had a regular practice together. After just a few weeks of unusually competitive offseason scrimmages, the Lakers' basketball boss can't wait to see how James' leadership will translate into real success. The King, LeBron James, has left behind his kingdom in northeast Ohio once again. James is taking his talents to Long Beach this time to join the Los Angeles Lakers. This has a different feel to it when he made "The Decision" and took his talents to South Beach to join the Miami Heat. LOS ANGELES (AP) — Mitch Chortkoff, a columnist and beat writer who covered the Los Angeles Lakers for over 50 years, has died. He was 78. He died Tuesday at a health care facility in Van Nuys following a long illness, according to his brother Stan. Raptors boss Masai Ujiri better have some magic plan. Because if he doesn't, Lakers boss Magic Johnson certainly will. Before Kawhi Leonard and DeMar DeRozan — the headline pieces in a four-player trade between San Antonio and Toronto on Wednesday — play a single game for their new teams, this much is clear: The Spurs got better, the Raptors are taking a gargantuan risk and the Los Angeles Lakers are going to sit back and see what happens. MEMPHIS, Tenn. (AP) — The Memphis Grizzlies have signed first-round draft pick Jaren Jackson Jr., a 6-foot-11 forward from Michigan State. NEW YORK (AP) — Between the LeBron James guessing games and the Kawhi Leonard trade talk, it seems NBA shopping season is well underway. It's actually just about to start. Terms like salary caps and contract options have been in the news for weeks, so fans might have an understanding of what they all mean. For those who don't, here's an attempt to explain how this all works. 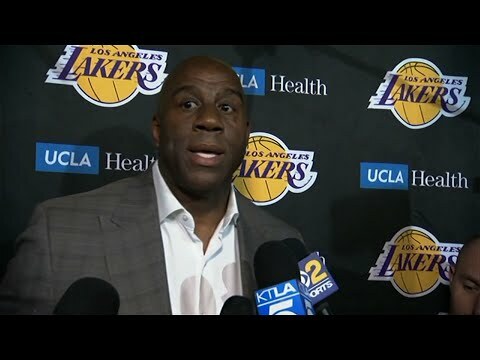 EL SEGUNDO, Calif. (AP) — Magic Johnson is betting his job on his free-agent recruiting skills for the Los Angeles Lakers. Johnson declared Monday that he will step down as the Lakers' president of basketball operations if he can't persuade an elite free agent to sign with the 16-time NBA champions within the next two summers. CHICAGO (AP) — The elevator stopped at the 16th floor of the swanky hotel, and after a few nervous steps down the hallway a soon-to-be professional athlete was ready to face perhaps the most unpredictable part of the NBA draft process. OAKLAND, Calif. (AP) — Stephen Curry and coach Steve Kerr's Golden State Warriors have repeatedly said they want to build something special for the long haul, to compete for championships year after year. OAKLAND, California (AP) — Stephen Curry and coach Steve Kerr's Golden State Warriors have repeatedly said they want to build something special for the long haul, to compete for championships year after year. LOS ANGELES (AP) — Laurent Ciman scored on a free kick in the third minute of stoppage time, and Los Angeles FC opened its $350 million Banc of California Stadium with a stunning 1-0 victory over the Seattle Sounders on Sunday night. Tyler Miller made three saves to earn the shutout for LAFC, but the Major League Soccer expansion team seemed headed to its first scoreless draw in the first home game in franchise history before its Belgian captain lined up a free kick in the final minute of play. The Philadelphia 76ers have advanced to the Eastern Conference semifinals for the first time since the 2012 season. The Sixers played some terrific basketball in the first round, eliminating the Miami Heat in five games. Throughout their first-round matchup, they received contributions from a number of players such as Joel Embiid, JJ Redick, Marco Belinelli, Dario Saric, Ersan Ilyasova and Robert Covington. The Philadelphia 76ers will have a chance to eliminate the Miami Heat in the first round of the NBA playoffs on Tuesday night, April 24 at the Wells Fargo Center. The Sixers hold a 3-1 lead over the Heat in the series. The tipoff for this contest is 8 p.m. (TNT, NBC Sports Philly). MIAMI (AP) — Ben Simmons had the first playoff triple-double by a rookie in nearly 40 years, JJ Redick scored 24 points and the Philadelphia 76ers outlasted the Miami Heat 106-102 on Saturday to move within a victory of the second round. MIAMI (AP) — Ben Simmons and Joel Embiid certainly aren't acting like playoff first-timers, and JJ Redick provided the veteran leadership that Philadelphia so desperately needed. The 76ers might very well be the NBA's team of the future. And that future might be starting sooner than many envisioned. EL SEGUNDO, Calif. (AP) — And now the real season begins for the Los Angeles Lakers. At least that's what the fans of the 16-time NBA champions repeatedly have been told while Los Angeles missed the playoffs and finished with a losing record for the fifth consecutive year. INDEPENDENCE, Ohio (AP) — LeBron James watched Kobe Bryant score big again. But he's focused on a different shiny trophy than the one his former rival snagged Sunday night. James joined Magic Johnson, Shaquille O'Neal and other current and former NBA players to congratulate Bryant after the Los Angeles Lakers superstar won an Academy Award in the animated short film category. Holding his Oscar, Bryant later said, "I feel better than winning a championship, to be honest with you. I swear I do."